Lost in the focus on double-digit salary increases in the tentative deal between LA Unified and UTLA is an agreement to overhaul the process by which the district’s 30,000 teachers will be evaluated. The district and the union also agreed to form a joint task force to re-write the Teacher Growth and Development Cycle, a series of protocols that form the basis of the final evaluation rankings, by 2016-17. Those procedures came under fire during Superintendent John Deasy‘s tenure when UTLA argued that Deasy was trying to lay the groundwork for merit-based pay when he added a new ranking of “highly effective” to other evaluation metrics. The union took the issue to the state labor board, PERB, and a judge ruled in its favor. That decision ultimately forced the district to eliminate the added ranking and revert to the previous system. But it still left teachers and their supervisors — school principals — frustrated and confused. Principals especially complained that the system had become too burdensome with a backlog of paperwork, leaving little time to conduct multiple class observations and to provide meaningful feedback. Which is why, Alex Caputo-Pearl, president of UTLA, told reporters this week that the changes to the evaluation system are among many of the “immediate and concrete improvements” in the new agreement. In theory, the purpose of teacher evaluations is two-fold: to identify struggling teachers in need of additional professional development and mentoring and to discover gifted teachers who can serve as mentors to share best practices. In LA Unified’s case, the new evaluation agreement eases any threat of losing $171 million in federal funding through a waiver to the old No Child Left Behind program. The government insisted on a three-tiered evaluation system to qualify for the money. 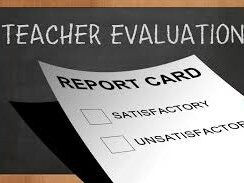 In recent years, amid the school reform debate, evaluations have also become a tool in the equation used to fire “ineffective teachers.” A poor rating coupled with low student scores on standardized tests is often the foundation for defining a bad teacher. Around the country it’s often at the core of contentious contract negotiations and legal battles between teachers unions and school district officials, politicians and lobbyists. It was also a recurring theme in last year’s landmark education trial, Vergara v. California. In that case, plaintiffs successfully argued that teacher layoffs should be based on teacher effectiveness judged by performance evaluations, not on “last-in, first-out” hiring policies that give teachers with seniority preference over newer teachers, regardless of their performance ratings as has been the case in LA Unified due to the existing bargaining contract with UTLA. Vergara is now under appeal. Last-in, first-out was a policy Deasy hoped to overturn. But his unilateral directive to make student data account for up to 30 percent of a teacher’s evaluation met furious backlash from teachers and was quickly rescinded. “But I expect it’s going to be a system that’s about people, not algorithms,” he added.